Guess people have been rolling the dice and using any type of vehicle for years. I can recommend Helena Fernandes from Brazill. She became a world wide sensation recently. She visits US once in a while and does some work in Little Brazil in Torrance. Google her name or "malfeitona" if you speak Portuguese. There might be a waiting list so book in advance. Strange question and not sure this is the right forum - does anyone know where I can find a tattoo artist who can do the Saline Valley bat sculpture on my shoulder? Good job describing the outhouses from back when. 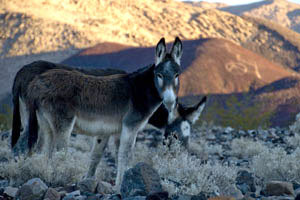 They were an interesting addition to the desert experience and looked like they belonged there. Helping dig a new hole was always a fun community experience. The two the Park put in place are the ugliest things in SV. They look to me like they really don't belong. I agree about a pic of the old outhouses. I will take a look when I have time. Wonderful drawing Miguelito! Thanks so much for sharing it. I love the view of the Inyos from around the springs. They are amazing just before sunrise. Thanks Jukebox Mark. I have spent countless hours over the past 41 years staring at the Inyos, often through my binoculars, and at home looking at photos. I am very much drawn to that view. When I went back to drawing landscapes in the past year, I had to do the Inyos. I also agree about the fine artistic pieces that remain in places like the restrooms and along the road. They are part of the atmosphere of the springs. Thinking of the restrooms brings back images of the volunteer built and maintained privies from pre-national park days. The three corrugated iron walls and open air front with its view of the Valley and Inyos was unique among such typically mundane outdoor experiences. New locations were dug each year and the privies (one on each side of the Palm Spring mound) moved to its new location. The old holes were filled in and relandscaped with scattered rocks, usually under the Wizard's supervision. But the privies were always the same funky structures and the comments and poetry engraved into the wooden frames were a pleasure to read on each visit -- a kind of reassurance that the Saline experience lived on another year. Here is some early Saline wisdom from the mid-'70s: "To do is to be and to be is to do, so do be do be do." For some reason I never took a privy photo. I would love to see one posted if anyone has one. The idea of hosting SVHS images had been floated a number of times as I recall. Each time the forum's resources prevented the implementation. I believe this forum has a limited size. Our admins may weigh in. Miguelito, this is where I was suggesting to host the art, visual and otherwise. Your drawing is wonderful. I have spent a lot of time looking at that range, and am similarly drawn to it. I try to spend some time visually meandering on it every time I'm out there. The contours are intriguing up close. I was fortunate enough to hike a section of the LMT a few years ago. I must say the artwork in the bathrooms is amazing. The Ravens are my favorite but all are great! Is there a way to have such talented artists add to them? I would love to see that. Also what are the "rules" for adding to them? What a good idea to have a thread for Saline Valley inspired art. 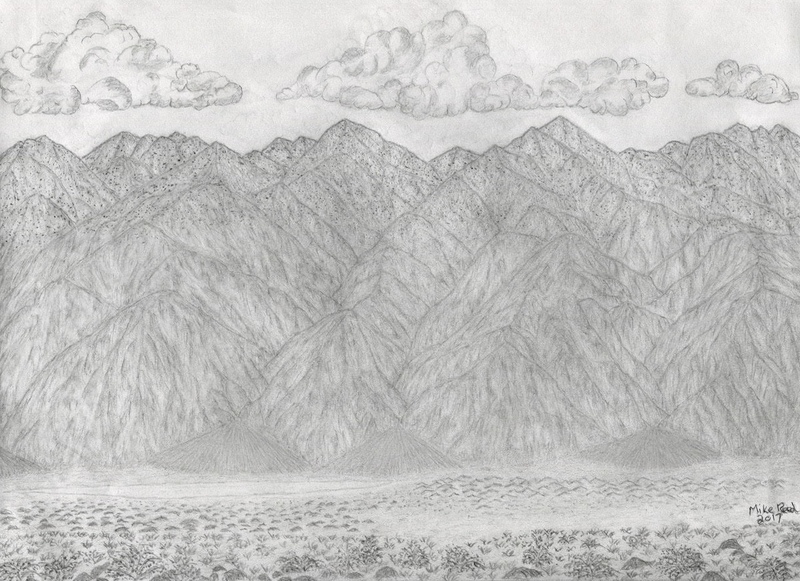 Here is a drawing I did looking across the valley from my campsite at Palm Spring in early March this year. I will put it on the art thread if one is created. Just like the picture at the top of the page reminds us, Saline has always been a place of inspiration, of the duality of both starkness and wondrous bounty hiding in plain sight. Saline has been an unending source of inspiration for me, as at has been for countless others who have recorded, captured or otherwise brought something to life from a spark shared in the land of fire. I got to thinking that maybe there should be a thread dedicated to sharing some of the work that Saline and the surrounding deserts have inspired. We do something of the sort in Darwin every so often, but it never gets recorded for posterity, except in Ida's books of poetry, Kathy Goss' freeform musings, and Gael's sculptures, some of which you can see from the highway if you slow down enough.